Honestly, all I really wanted was a little canister of pepper spray to ward off the occasional loose, aggressive dog I encountered on some of my trail rides. But what I ended up with was a Taser. My husband, Ron, insisted on it. He does tend to be a little on the over-protective side, but then again, there have been several incidents the last few years where I wished I’d had something more than sharp words and the weighted end of my split reins to defend myself. Ultimately nothing happened, but I hated feeling defenseless. First there were the men who exposed themselves to me on the trail. It was my naked trifecta, where three out of three successive rides included being greeted by men only too happy to display their “lassos.” Then there was the time that a pair of saddle tramps—I don’t know how else to describe them—tagged along behind me for nearly an hour, until I felt like they were stalking me. The worst part? One of them loudly called out that he was going to “relieve himself” in the bushes. If that wasn’t enough to give me the creeps, this weekend I heard about a couple of scary episodes down at the river park, where I like to ride to relax and unwind. Not only have numerous trucks and trailers been broken into while the riders were out with their horses, but there’s an oft-told tale going around that one rider was roped off his horse and told to hand the animal over. Fortunately, he was able to get free before the would-be bandits were successful. Close call or not, could you imagine someone trying to steal your horse? Even worse, stealing it while you’re on it? Didn’t those days end around 1880? I admit there are some days when Wally is being particularly obnoxious that I’d like to have a prospective felon on hand so that I could announce, “Here. You take him!” But 99% of the time, I’d fight like a banshee before allowing some dirt bag to steal him. Just to be clear, I’m not carrying a Taser on all of my rides. Really, if I rode in such a dangerous area that I couldn’t amble down the trails without the risk of being ambushed or visually assaulted, I’d stick a For Sale sign in my front yard and be done with it. But we have to be realists and acknowledge that there are a lot of jerks out there. 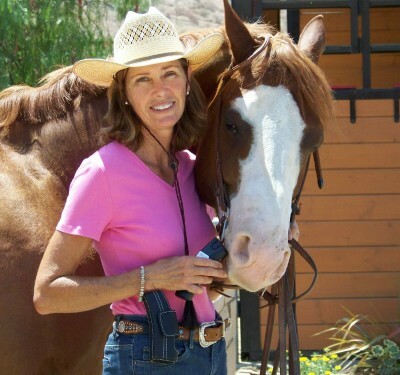 So to keep my husband happy, and to counter my loss of naiveté, I’m going to carry my Taser whenever I take a solitary ride through the sagebrush or venture into the hills beyond our community’s trail system. I realize that’s a frightening prospect to some folks who know me as a flibbertigibbet who trips over her spurs and can’t screw a lid back on a can of hoof oil to save her life. But I am quite safe around weapons. Maybe that’s because my dad taught me how to properly handle and shoot a gun when I was young. Other girls were playing with Barbie dolls while I was plunking at targets in the desert. This could also explain my kindred spirit connection to Annie Oakley. Yet while I may not be wielding a pearl handled pistol, I will be packing a Taser sometimes. Because ain’t no one going to steal my horse, pardner. Good article! We’ve just got to be aware these days. Ha! I don’t run into naked men around here, but I have had most of my stuff stolen out of my truck bed when I was out on a ride so I know those kind of people are out there. Hey you’re not the only one tripping over your spurs! I do that everytime I use western ones. lol. Ha! Who whoulda thunk it? And how and where did you get a taser?